This is my first time using ProRep Tortoise Life and I’m happy to say that I’m delighted with the results of this brand. The substrates really met the needs of my daughter’s new pet tortoise who really enjoys frolicking around in the substance. I read the label and I especially love how the manufactures used an array of natural ingredients that all blend well together to provide a safe environment for the tortoise. The ProRep Tortoise Substrate also has an added ingredient of pure limestone just in case our little turtle decides to ingest the substrate. If this happens, I won’t have to worry because I know he’ll be taking in something that won’t hurt his digestive system. With the limestone, he’ll also be receiving a nice dose of calcium which furthers reassures me that we won’t have to worry too much about keeping him healthy and safe. The price for the 25 liter bag isn’t bad either, as I was a little concerned about how much it would cost to maintain the turtle’s needs. Surprisingly, all of the items we’ve purchased have been very affordable, including the Pro Rep Tortoise Substrate. We are also finding that the substrate lasts for a good while so we don’t have to worry about buying another bag the next time we go out. All in all, if you have a pet turtle, or turtles, I recommend you pick up a bag of the Pro Rep brand. you can’t beat a pet product that meets your expectations while saving you time and money. What Is A Horsefield Tortoise’s Natural Habitat And Why It Is Important? What is great about Horsefield Tortoises is everything. They make wonderful pets and companions for those who know and appreciate their wonderful species. The only thing about owning a Horsefield Tortoise is this. You do have to be committed to providing them with nothing but excellent care. This excellent care must be daily and weekly. The good thing about Horsefield Tortoises is that they can live for a very long time. This long time can be anywhere from 40 to 80 years on the average. However, how long they live is dependent on one thing, and this one thing is the level of care and maintenance that they get from their human owners. With this said, a Horsefield Tortoise must be tended to, and not just with a high level of caring. But also a high level of promise and love to look out for them throughout their lives. One thing that must be done correctly with a Horsefield Tortoise is this. The pet owner needs to make sure that the Horsefield Tortoise has a natural habitat that will suit it in every way. It is important for a number of reasons. The Horsefield Tortoise needs to feel totally at home in its living enclosure. It should also a home for them as well. This means that their habitat should be as natural as that of their home in the wild. You should make their indoor or outdoor living environment a place where they will thrive, be safe, and enjoy frolicking around in. A Horsefield Tortoise that is healthy, is also, a tortoise that will be happy in every way. 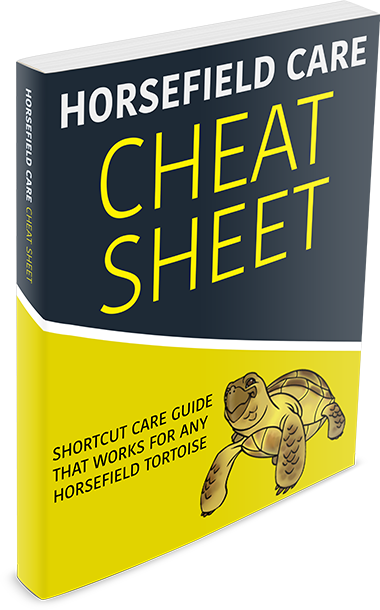 You want to provide your Horsefield Tortoise with optimal care and the best optimal care is clear. It is all about replicating their natural environment of the Mediterranean as much as possible. Horsefield Tortoises are very outgoing and interactive tortoises. What type of housing should you choose for your pet Horsefield? Should you make him or her a living enclosure indoors or outdoors? The answer is simple. The outdoors is far more preferable for a number of reasons. Living outside in a living enclosure is the most natural for a Horsefield Tortoise. Lots of things are better outdoors. These lots of things do include everything from sunlight to space to plants and fresh air. A Horsefield Tortoise that can live in a living enclosure that is all natural will make for one happy and healthy turtle on all fronts. It makes for ensuring that your Horsefield will be thriving and content the most.